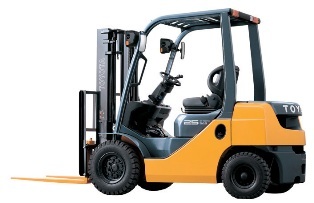 Advancements in technology and engineering help the Toyota 8-Series set new standards in the forklift industry. With exclusive Toyota safety features such the System of Active StabilityTM and Operator Presence Sensing System, operators are assured of a safer working environment. A smart ergonomic design incorporates better visibility, reduced noise levels and vibration, and exceptionally comfortable operation. All this adds up to ease of use, reduced operator fatigue, and increased efficiency and productivity. Environmentally friendly engines and exhaust systems emphasise Toyota’s commitment to the environment and outstanding fuel efficiency. Featuring the world's first System of Active Stability (SAS), the 7-Series pneumatic tyre helps reduce the number of forklift accidents to increase safety and productivity. * Active Mast Function Controller senses and reacts to instability by limiting mast angle and speed according to the load's height and weight. * The OPS system helps to prevent accidental movement of the forklift and forks when the operator is not seated at the controls. The OPS system senses if the operator is properly seated and at the controls by means of the seat switch. When the operator is properly seated at the controls the seat switch will go “on”. * If the operator is not seated at the controls the seat switch will turn “off”, and the OPS system will disable the ability to lower the forks, or tilt forward or back along with all the other loading and unloading movements. * Increased structural thickness improves frame rigidity and prolongs service life. * Spacious operator compartment with wider foot area helps reduce operator fatigue. * The design of the Toyota 8-Series forklift is focused on improving the forward, downward, and upward operator’s visibility. The lower instrument panel, the relocated display, adjustment of the mast width and other factors ensure outstanding forward visibility on the Toyota 8-Series forklift.